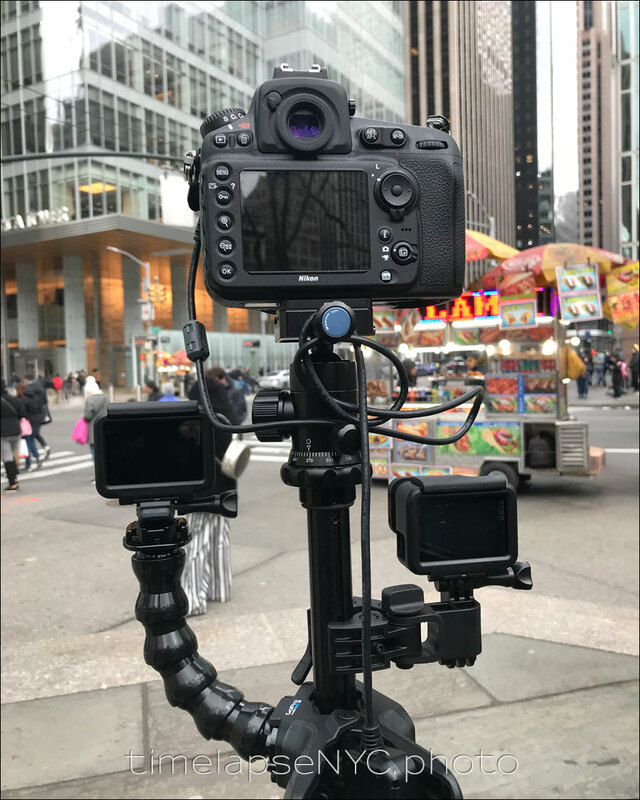 You may well wonder what this contraption is – two GoPro cameras, and a larger camera mounted on a tripod. With the GoPro Hero action cameras, we have a compact camera that is weather resistant and water-proof. But it has a smaller sensor and much less control over the settings than a larger, “proper” camera. I therefore wanted to do a test to see how the footage from a GoPro compared to that of a D-SLR. The main reason to use a DSLR (or similar mirrorless camera), is that we can control all the camera settings. We can also shoot in a RAW format which allows us much more control in post-production of the final video footage. But using a larger camera is also more expensive, and also more time-intensive than using an action camera like the GoPro. With that, it will be obvious already that there will be a difference. But how much of a difference, and will it be something that would concern a client. On the left there is the GoPro Hero 5, and on the left a GoPro Hero 6 with a Neutral Density filter. A neutral density filter allows us to get a slower shutter speed, and subsequently smoother movement in the scene. With a larger camera, we can set the relationship between the shutter speed and interval (the time between photographs), to better control how fluid the movement will appear. With the GoPro, we don’t have that control. But I did try the Neutral Density filter on the one camera to see how much of an effect it would have. Here are the results, shooting for 1.5 hours to get 6 seconds of video, using an interval of 30 seconds for each camera. With the DSLR, (a Nikon D810), the shutter speed was 20 seconds. But with both GoPros we had no control over the shutter speed. We can see this difference in how the GoPro footage has a certain ‘staccato’ appearance. People’s movement become discrete jumps, instead of more fluid. If you look at the GoPro footage with the neutral density filter, it doesn’t appear to have had any noticeable influence. The movement of the cars are also much smoother with the DSLR than the GoPro footage. To my eye, the video clip at the top, shot with the DSLR, looks more cinematic and more crisp. Your final preference might very well be swayed by the difference in budget between these two options. Hands down the DSLR is the clear winner in the terms of quality. GoPros are still cool little cameras though. Too bad that my iPhone X takes better video quality than my Hero 3 Black now. Gotta love trying to keep up with technology! Great info about GoPro time-lapse & DSLR & mirrorless cameras. Whats the name of the clamp you are using for the go pro on the right hand side and do you have a link for it please?